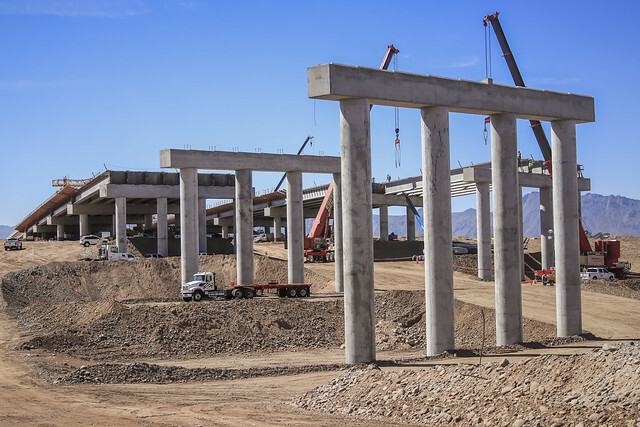 A project as large as the Loop 202 South Mountain Freeway makes for some impressive pictures, including the slideshow above produced as crews set extremely long girders to create two half-mile bridges that will span the Salt River. There's plenty more to explore on the South Mountain Freeway Flickr page – 31 albums in all, from the start of construction on the 17th Avenue interchange to showcasing colors and designs to be used on interchanges and walls to creating the I-10 interchange in the West Valley. You'll see some videos there as well, including this one showing one of the long, long Salt River bridge girders arriving at the construction site.